Are you hosting a dinner party or just having friends over for a snack? When serving cheese, the amount of cheese to serve varies based on the occasion. Cheese gives you endless possibilities when served as a main course and should never be limited to just starters or desserts. Get creative with the garnishes and be sure to have plenty of different types of bread, crackers, meats and cheeses for your guests when serving a cheese board as the main course. Give your dinner party an added twist, by also serving a cheese that most of your guests would normally avoid, i.e. Danish Blue or a cheese with washed rind. For a more traditional dining experience, a Soufflé or Baked Double Crème still lets the cheese be the main attraction, while combining it with smoked meats in a pie makes for a wonderful dish, and an experience worth savouring. If you are serving a cheese board as a meal, we recommend 7-8 ounces per person. If you are serving cheese for lunch, we recommend 2.5-4.5 ounces per person. A cheese board is a great way to pep up your taste buds before the main course, and it is perfect when you want to impress your guests early on. Choose from a selection of soft and hard cheeses and serve them with dried meats and crackers for different textures and flavours. Traditional Danish Blue, Double Crème White and Aged Havarti give you several serving choices and guarantees that even choosy guests can join in. Starters should never leave your guests feeling full, so make sure not to serve too much. 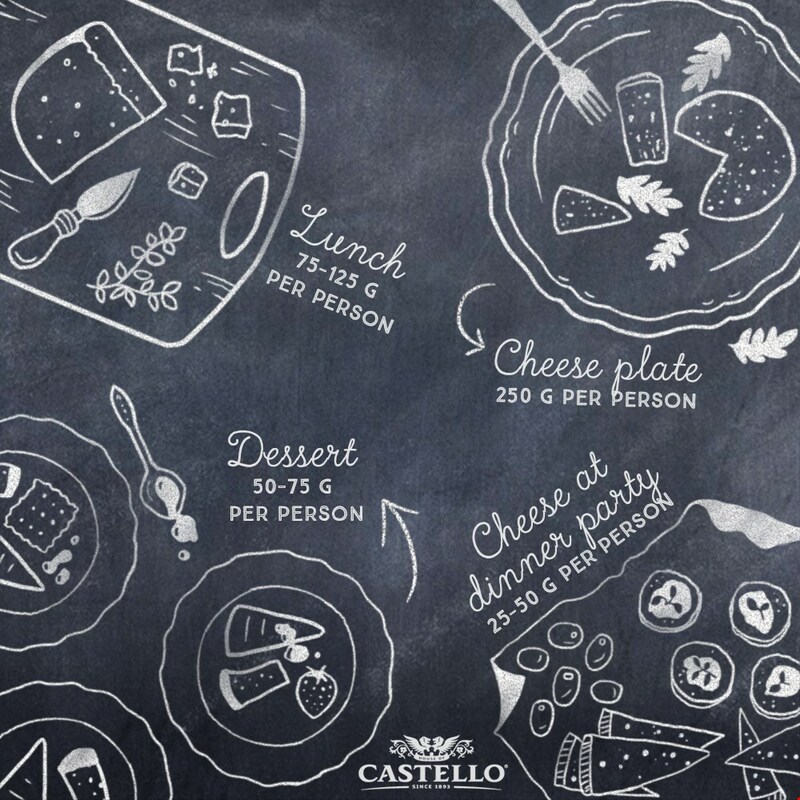 If you are serving cheese at a dinner party, we recommend 1-1.75 ounces per person. Treating your guests to a cheese platter as a dessert lets them finish off any leftover wine from the main course and ensures that no one leaves feeling hungry. Select a few of your favorite cheeses and matching garnishes, and place everything on a cutting board or platter for ease of use. If you are serving cheese for dessert, we recommend 1.75-2.5 ounces per person. For an entire meal you should plan for 20-28 ounces of food per person including bread. So if you serve a heavy starter, choose less food for main and dessert so you end up with the right total amount.